Tasmania is separated from mainland Australia by the 240 km stretch of Bass Strait. Twelve thousand years ago sea level was rising as the most recent period of global glaciation eased. The land mass now known as Tasmania was cut off and the Aboriginal people living here were isolated. They shared many traits with Australian mainland Aboriginal people but also developed physically and culturally into a distinctive population. Tasmania’s recorded history began when a Dutch navigator sighted the West Coast mountains in 1642 – but Aboriginal people had lived on this island for tens of thousands of years before then. During the last Ice Age 12,000 years ago, Tasmanian Aboriginals were the most southerly civilization on Earth. By the end of the 18th century, British prisons were seriously overcrowded. The government’s solution was to lock convicts in hulks – old ships anchored in river estuaries. When the hulks were full the government decided to get rid of the convicts to the new colony of New South Wales (Australia), where they could be used as cheap labour to build the new colony. European colonists first arrived in 1803 – many of their solid Georgian sandstone buildings still stand proudly in Tasmanian cities and country towns. Convicts came from all walks of life. Most had little education, forced into crime to survive in a rapidly industrializing Britain. Many of their crimes were petty, such as stealing a handkerchief or some clothing. But there were also educated convicts, with skills that enabled them to be used as clerks or draughtsmen, or with training in professions such as medicine, architecture, printing or building – all essential in building a new colony. For about the first 10 years there were more convicts than free settlers. This meant that convicts, as well as doing hard labouring work such as digging new coalmines, had to fill positions of responsibility such as medical assistants or trusties in the gaols. Many, especially the women, were assigned to free settlers as servants. Male convicts, often in chains, tunneled new coal mines, cut timber in the thick forests, quarried stone, built roads, made bricks, built ships. Many overseers were whip-wielding sadists. The authorities used punishments such as flogging, solitary confinement and bread-and-water diets to try to control misbehavior and protests about conditions. Tasmania is a land of it’s own, a place of wild and beautiful landscapes, friendly, welcoming people, a pleasant temperate climate, excellent wine and food, a rich history and a relaxed lifestyle. 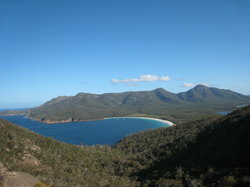 Tasmania possesses magnificent lakes, mountains, beaches, rivers, waterfalls and so much more. Compared to the rest of Australia, Tasmania’s diminutive size is one of its attractions since it is possible to see much of the island in a few days. Over a third of the state is reserved as National Parks and Wilderness World Heritage Area, a refuge and habitat for rare plants and animals. Encircled by the Southern Ocean, Tasman Sea and Bass Strait, we breathe the world’s cleanest air and rejoice in pure water and fertile soils our wine and food are acclaimed around the world. Being a small island state our seafood is second to none. *Tasmania has more than 2000 km of walking tracks and 18 national parks. *The Tasmanian Wilderness World Heritage Area covers 1.38 million hectares. *The Theatre Royal in Hobart is Australia’s oldest live theatre. *The reputation of Tasmania’s premium wines is protected by the only legislated apellation scheme in Australia. *Hobart has the nation’s second-lowest rainfall (626 mm or 24 inches) of all Australian capital cities, and is overlooked by Mt. Wellington. Tasmania is a wonderland and an ancient one at that. Its landscape is a never-ending display of nature at work. From grand forests inland of the state, to dramatic bluffs and headlands around its coastline, stunning vistas are never far away. Launceston in the North, Burnie and Devonport in the North West and Hobart in the South are the major centres.